There are several areas of old style back alleys, supposedly from the Ming era but I think heavily reconstructed, but no less charming for that – especially Jin Li, which has a host of bars, restaurants and street food outlets and a little garden. At night it is beautifully lit with many lanterns. Nearby, we found a big Sichuan restaurant arranged round a big courtyard with ginkgo trees and a waterfall – charming and with unusually (for China) friendly staff. So good we went back on my birthday. 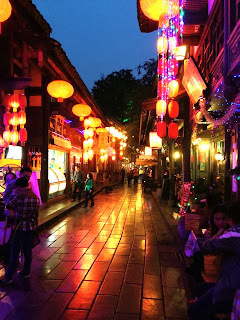 Another such area is called Quan Xiangzi, or ‘the Wide and Narrow Alleys’ in guidebooks. Of course, these areas attract lots of tourists, mostly Chinese though. For a change we also walked along the river to a newly built night life area, called Lan Kwae Fong after the similar set up in Hong Kong. Pleasant enough but fairly characterless. It features a Bavarian style micro-brewery: beer tasted authentic enough. Crossing a very ornate bridge from here, we found a line of bars in shacks facing the river, all neon and blaring K-pop, but rather more real, so we had a couple of drinks there. An odd phenomenon of night-time China is the ear cleaners. They come around constantly, clacking their long metal instruments together, offering to de-wax you for a small charge. Despite my occasional problems in this area, I declined.